Most Favored Floor Plan in the Most Favored Resort Community! * Free domestic long distance calls. Location: Located in the heavenly beautiful 'Island' Emerald Island Community 3 miles to Walt Disney World and minutes' drive to shopping & dinning and 8 miles to Orange County Convention Center and major Hotels for all kinds of tourist and cooperate events, this community serves as a haven from the larger world while remaining central to everything the worlds' most popular destination. Surrounded by a big Conservation Area with pond & heavy woods, the community encompasses over 300 acres right in the middle of the community. Our guests can utilize all the facilities provided in the resort for free, which include the clubhouse sauna, fitness center, games arcade, internet cafe, Tiki-bar, heated community pools and spas, volleyball and tennis courts, kiddie play areas to name a few..
Local Professional Management -a Phone Call Away: We have a professional and dedicated manager who strives to make our home a comfortable and affordable alternative for your Walt Disney World vacation. If our villa is not available for the dates you need, we have other similar high standard homes in the same community available for your consideration. All our homes were custom decorated by the owners and was furnished to a high standard. All bedrooms have linen, towels, hangers, and blankets. You can find extra linen, blankets, and towels in the closets. Laundry facilities (a washer & separate dryer) can be found in the utility area of the villa. We absolutely loved our stay here! My Fiance's and I's goal was to bring our 2 boys and grandparents here to make memories! And this helped us do that! While we just needed a place to stay between Universal Studios and other great attractions around the area, we actually made a day to stay at the house and relax! The boys had a blast in the pool! The resort itself is very beautiful... Very peaceful and welcoming... We highly recommend to stay here! When we come back to Florida this is where we will book! Thank you so much for letting us stay in your beautiful home! BED BUGS, BED BUGS, BED BUGS!! Do yourself a favor and don't stay in this disgusting home! Although I know the space and location of the home are tempting, it is not worth the bed bug infestation that will come home with you! We stayed the last week of January 2019. I noticed bites covering my hands, arms, neck, and face on the 7th day of our stay. I hope the sheets were washed but I am sure the top blanket wasn't. I was hoping I didn't bring them home but alas I did. Now we have to spend hundreds of dollars to try to get them out of our house in hopes that they don't get to my children. A lot on other things were annoying about this house. They only provide 1 roll of toilet paper per bath room and no hand soap. Only 2 garbage bags, and 2 dishwasher tabs and no dish soap. for a party of 10 they didn't last long. No laundry detergent is provided Although they want you to wash all the towels before you leave. The pool and hot tub were disgusting and you had to pay an extra $200 to have the "hot" tub heated. The heat in the house was set very low so everyone in the house was so cold the first night with out any additional blankets in the rooms. It's clear that very cheap people own this house who want to nickel and dime you for everything. I have never written a review before but I had to warn the ones who stay in this house after me. God bless. I am surprised to see such a blatantly false review on our property. We have already checked and there are no bedbugs on our property. From the period that you stayed (Jan 25-Feb 2), we have not had any reports whatsoever about bedbugs. If what you said was true, then the other three guests that have stayed since then would have also reported having bedbugs. But they didn't--because there are none. Unfortunately, we can't offer unlimited toiletries. This property is not a hotel, and we made it clear that it would be best to bring some of your own supplies. We lower the price this way and we find it fair, because otherwise we would possibly be charging guests more for toilet paper, toothpaste, and soap that they did not like or did not use. These are the same reasons why pool heating and BBQ are separate fees - we do not profit from these services and you are paying for what you get. About pool heating - it is wintertime and we warn people before they opt for the service. Heat is lost very quickly from the record-breaking chills. This is another reminder that it is imperative that any issue you encounter during your stay is brought up immediately to our local management company--not after your stay. This way, we can resolve your issue ASAP so you can have a better experience. Of course, if you don't report anything, we will not know until after your group has checked out. So again, it is important to let us know. This negative review is unfair to us. We try our best to make your stay comfortable, and in the end we are all trying to make a living. But lies and misinformation benefit no one and only harm us. Great place to stay while enjoying DisneyWorld! We had The Best time staying here! Every person in our group of 14 enjoyed the quiet time in their king suite or private bedroom, as well as coming together in the game room, around the pool or in the kitchen/living room. So close to DisneyWorld, we could rest and eat then return to any of the parks close by. Love this home! 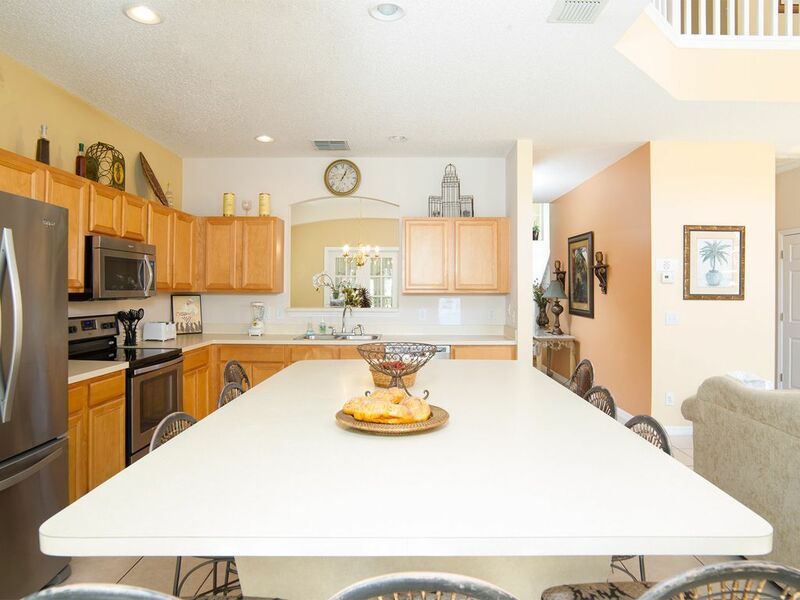 We had plenty of space, all amenities are up to date, the home was clean, neat and it is very convenient to theme parks and shopping. I would definitely rent again. With minutes of Walt Disney World and a short drive to shoppings and dinning, this community serves as a haven from the larger world while remaining central to everything the worlds' most popular destination with millions of visitors a year has to offer! ! Golf: For any golfers in your party the fabulous Mystic Dunes Golf Club is just a few minutes away. There are many other world renown golf courses designed by golf greats within 30 minutes drive, such as Grand Cypress Golf Club (Jack Nicklaus); Orange County National Golf; Orange Lake Country Club(Arnold Palmer/Ed Seay); Walt Disney World Golf Courses (Pete Dye, Tom Fazio , Joeseph L. Lee); Celebration Golf Club(Robert Trent Jones); ChampionsGate Golf Resort (Greg Norman) etc..
Email Us for 15% off Last Minute Deals & Specials on all occasions! Rate doesn't include tax & cleaning fee unless special arrangement. Rate based on group of up to 14 people. Pool heating $30/day, $199/week. Grill $50/trip.